Human pigmentation is a polygenic trait which may be shaped by different kinds of gene–gene interactions. Recent studies have revealed that interactive effects between HERC2 and OCA2 may be responsible for blue eye colour determination in humans. Here we performed a population association study, examining important polymorphisms within the HERC2 and OCA2 genes. Furthermore, pooling these results with genotyping data for MC1R, ASIP and SLC45A2 obtained for the same population sample we also analysed potential genetic interactions affecting variation in eye, hair and skin colour. Our results confirmed the association of HERC2 rs12913832 with eye colour and showed that this SNP is also significantly associated with skin and hair colouration. It is also concluded that OCA2 rs1800407 is independently associated with eye colour. 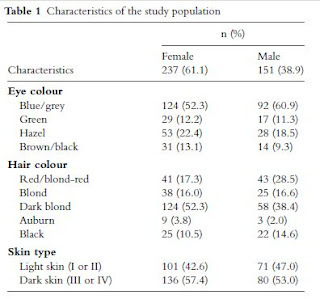 Finally, using various approaches we were able to show that there is an interaction between MC1R and HERC2 in determination of skin and hair colour in the studied population sample. "studies have revealed that interactive effects between HERC2 and OCA2 may be responsible for blue eye colour"
Now they are saying it is actually an interaction between OCA2 and HERC2 that causes blue eyes? Are they suggesting that having two copies of the blue-eyed version of the OCA2 gene is not enough, by iteself, to produce blue eyes, but that having HERC2 rs 1291382 is also a requirement? Also from the abstract: "using various approaches we were able to show that there is an interaction between MC1R and HERC2 in determination of skin and hair colour"
Again that word "interaction". Hmmmm. Does anyone out there have access to the actual study, rather than just this teasing abstract? I'm very curious about what is actually being implied here. Obviously, MC1R is the loci associated with red hair, so I'm curious what impact HERC2 might have on the expression of that phenotype. "I thought OCA2 was the 'blue-eye' gene". i met poles many seem to have brown and blonde hair with very light skin or a tan blonde skin! many have light eyes i noticed! i wonder what the rates for sardinia is? my relative seem to just be the extreme mediterranean black dark brown eyes black dark-brown hair and very olive light brownish skin etc!